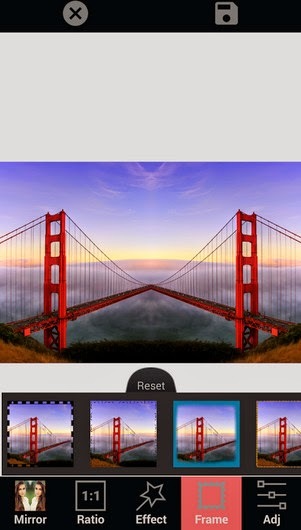 A brand new photo editor with mirror effects as its main feature. 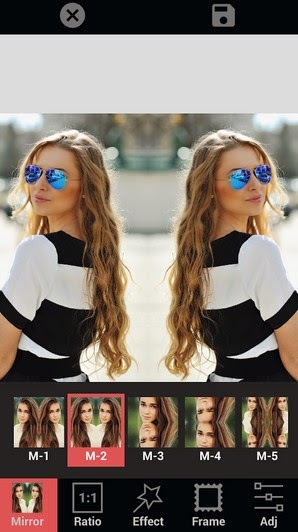 Free download Mirror Image Photo Editor Pro v1.0.0 Apk and impress your friends. Do you love mirror effect in photos? Do you love doing it on your own? If yes, download the free android app Mirror Image on your android device and start running a photo studio at your fingertips. The free android app Mirror Image allows you to create mirror effect in your photos. You can create left-right, up-down, reflection, repeating as well as reflection style enabled photos with this photo editor app. Furthermore you can apply several photo effects and designer photo frames to these mirror photos for making them more attractive. • You can randomly apply mirror effect, filter effect, as well as you can add photo frame for creating a designer photo effects. • You can share the photo on Instagram as well as post it on the social networking sites like Facebook and Twitter. • You can enjoy other value added features like adjustment of brightness adjustment, contrast, warmth, saturation, and auto color adjustment for the most dramatic effect. Now with the app Mirror Image you can be the expert photography editor and you will be able to create wonderful photos of your own as well as for your loved ones. ★★ Select multiple image ratio. ★★ Provides highest resolution results. ★★ Tablet design provide more space for photos.